JX series steam traps can be installed on various types of equipment that uses steam as a heat source. The series covers a wide range of condensate loads, from the 100’s of kg/h to several 10’s of tons/h, making this TLV's most widely used series of steam traps. In addition to offering compact size, continuous discharge of condensate, and large condensate discharge capacities, these steam traps are equipped with an X-element air-vent that provides a powerful automatic blow-out function. All these qualities gathered in one trap make the JX series ideal for steam-using equipment. When the X-element is cold, it opens the air vent valve a full 3.5 mm, rapidly discharging initial air 3.7 times more rapidly than the former integral bimetal air vent included in the J3N. Equipment start-up time is also shortened through the rapid discharge of hot air up to approx. 6°C below saturation temperature, something previously not possible. The Free Float® adjusts the valve opening in response to the amount of condensate flow and continuously discharges condensate, preventing any accumulation of condensate inside the equipment. The X-element reacts with great sensitivity to hot air entrained during operation, and discharges it rapidly. These synergistic effects result in maximized heating efficiency. The J3X is roughly the same size as the former J3N, yet it offers a larger discharge capacity than even the former J5N, which was one size larger. The X-element is comprised of a valve and a diaphragm that transmits the force of a thermoliquid (temperature-sensitive fluid). When surrounded by steam, the valve is closed. When condensate, air or other non-condensable gases are present, the valve is open. It can also discharge high temperature non-condensable gases, something bimetal air vents are unable to do. This is made possible due to the special properties of the thermoliquid. Thermoliquid, like water, is liquid when kept under a certain pressure and temperature, and expands to become a gas when its temperature rises above a certain point. The temperature at which it becomes a gas is approximately 6°C (22°C for air vents) lower than the temperature at which water becomes steam. So when it is surrounded by steam, the thermoliquid is a gas and the chamber containing the thermoliquid expands and pushes on the diaphragm. This causes the gap between the valve and the valve opening on the diaphragm to close. In contrast, when the area around the X-element is at a low temperature (when it is either condensate or air), the thermoliquid is in the liquid phase and the valve is not being pushed closed, so condensate and air are discharged from the gap between the valve and the valve opening. Fail safe features are necessary in quality precision instruments. 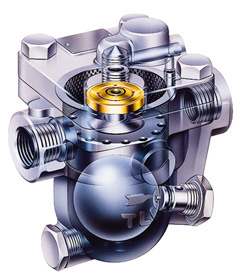 TLV therefore designed the X-element in such a way that the valve remains in the open position ('fail open' safety feature ) in the event the diaphragm ruptures. If a steam trap fails, the valve may either remain open (blowing) or it may remain closed (blocked). 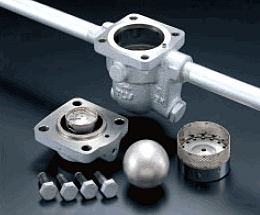 If the valve remains closed, condensate accumulates in any equipment that cannot be shut down in order to replace the failed trap, and this pooling of condensate impairs the equipment's heating performance. On the other hand, if the valve remains open, the supply of steam continues uninterrupted and the equipment can continue to be productive. 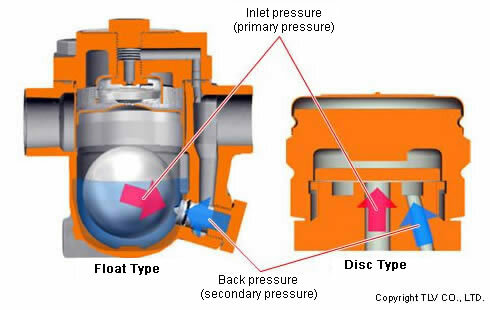 Due to this special design, even if the diaphragm ruptures and becomes technically 'closed' (by remaining in contact with the valve opening due to the flow of steam and condensate), condensate, etc. can still flow through the valve opening via the hole in the center of the valve. Constructed to resist erosion through features like: a simple construction with no levers or hinges and only one moving part, the Free Float®; an extra-large surface area in the condensate discharge passage; improved thickness of passage walls from 3 mm to 5 mm (model J3X); and a selection of highly-durable materials. Reactor kettles, vulcanizing kettles, presses, jacketed kettles, distillers, etc. Hot air dryers, air conditioning equipment, absorption chillers, unit heaters, steam air heaters, heat exchangers, roll heaters, cylinder dryers, re-boilers, air preheaters, etc. High precision technology gives TLV's Free Float® traps superior reliability. They are thus confidently used in a wide variety of industries on the processes that are the lifeblood of manufacturing.